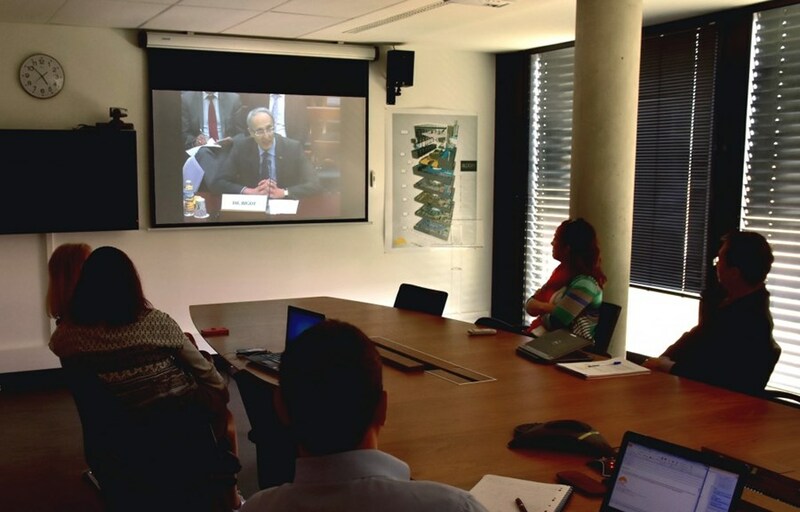 "We will be able to deliver on time"
Members of the Cabinet of the Director-General watch the live feed from the Energy Subcommittee Hearing on fusion energy science. On Thursday 20 April in Washington DC, the Science, Space & Technology Subcommittee on Energy of the US House of Representatives conducted a hearing on fusion energy science. Bernard Bigot, Director-General of the ITER Organization, Stewart Prager, Director of the Princeton Plasma Physics Laboratory, and Scott Hsu, a Physics Division scientist at the Los Alamos National Laboratory, were the three "witnesses" called to testify on the present state, perspectives and challenges of fusion research. While the atmosphere was studious and supportive, the questions were without concession. "There is no single idea that is a magic bullet that would deliver commercial fusion in 10 years," answered Stewart Prager to a question from Ranking Member Alan Grayson (D-FL). "But we can greatly accelerate the pace. There's no question fusion can be developed in a time scale to have a huge impact on how we procure energy in the middle of this century." Answering a question from Vice-Chairman Steve Knight (R-CA) ITER Director-General Bigot stressed that keeping the schedule was now paramount and confirmed that ITER "will be able to deliver on time." We'll have a more detailed report on the hearing in the coming days. The two-hour long hearing "An Overview of Fusion Energy Science" can be viewed here. Read the Committee's press release here.